Reel News Update #24: Major new film on climate change – FFRUKiT! 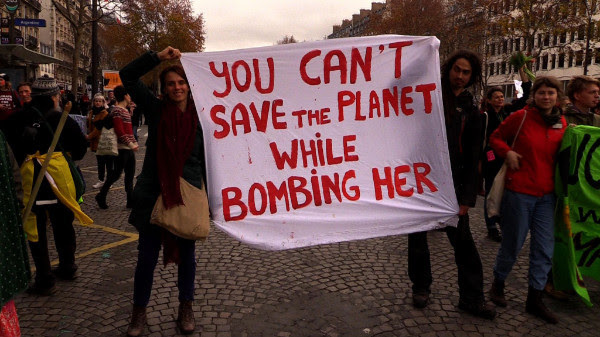 Paris: Climate Change, Militarism and War – the rise of a new militant climate movement Click here to watch video (36 min 38 secs) The Paris climate talks in December 2015 were a con. Despite agreeing a commitment to keep global warming to 1.5°C, the actual plans set forward by governments point to warming of between 2.4°C and 3.7°C – which will mean disaster for the planet. But the Paris talks also signalled an important change in the climate movement as thousands of activists gathered from all over the world to organise global action. The days of lobbying governments are over; now the movement is being led by frontline working class, indigenous and peasant communities, who are taking militant direct action against extreme fossil fuel projects, demanding an end to war, and campaigning for a just transition to renewable energies which would create millions of jobs worldwide - solving the economic crisis at the same time as the climate crisis. This film gives you a chance to hear frontline voices from all over the world, and how the battles against climate change, militarism, war and austerity are increasingly becoming one struggle. new film on climate change – FFRUKiT! <Loved it! helpful and it has helped me out loads. I’m hoping to contribute & help different customers like its helped me.